Digital Signage is an innovative media that enables effective messages distribution to people at targeted place on targeted time. It is able to push the target with close timing to the purchase determination at stores or along street, so close approach to the Niche market is easily achieved. Digital signage realizes the evolved achievement. 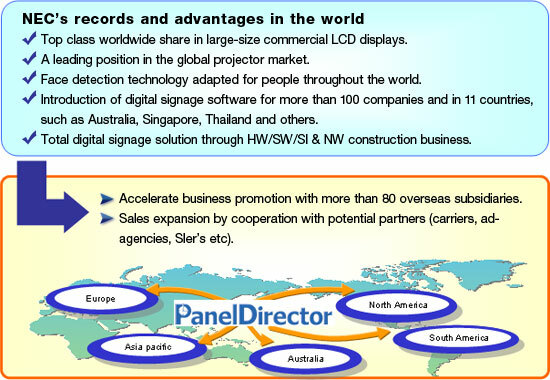 Panel Director is NEC’s integrated brand for Digital Signage Solution. It delivers contents on panels in a much more effective way which enhances value of media, competing power and know-how. Digital Signage showing attractive contents with picture, animation and sounds is used as next generation advertising media in a variety of situation such as financial industry, government, media, retail shop and manufacture. NEC provides the best solution for customers based on large capacity and high reliable network, and IT technology such as cloud oriented service platform technology and many kinds of application. In addition to contents management and audience measurement, all service from network construction to datacenter construction and management are provided as total service. NEC’s digital signage solution makes it possible to figure out effectiveness of the contents by rich experience and know-how. New business strategy will start from NEC’s solution. November 10, 2010 – NEC, Intel and Microsoft announced the three companies’ strategic relationship to provide integrated digital signage solutions. 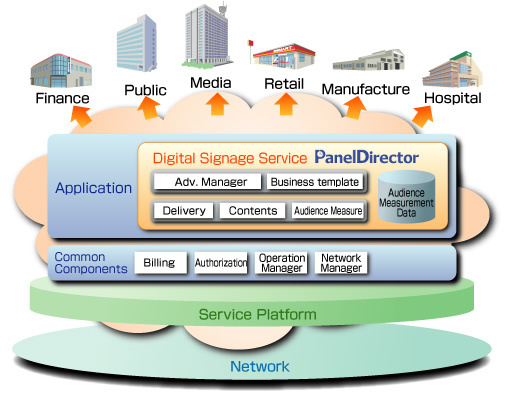 Download the documentation of “NEC’s Next Generation Digital Signage”.